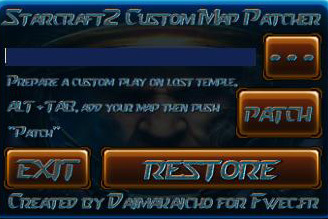 Select the map you want to play and click "Patch"
If you are interested, there is a post explaining the technique behind it. Sincerely Coldragon, Daimakaicho, from fwec.fr (French!). Why does this not have a 5 star? You guys who are not giving it a 5 are just... nvm. This thing works great! This is very nice. But why use lost temple when that is a popular map? Why not make it replace one of the novice maps?